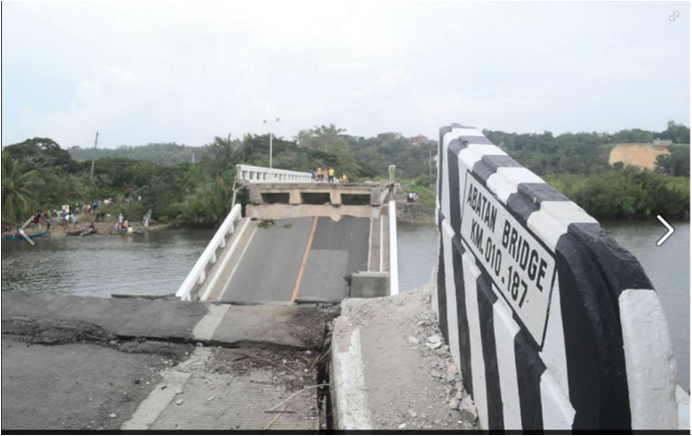 With the bad things that happened with government service delivery these days – from tanim-bala to market fires due to bad cables – it is easy to be swayed to the opinion that this government can never do right, and that everything in the Philippine government, whether local or national, are all wrong. If facebook posts and tweets are measures of the opinion of the “connected” Filipino nation (which, by the way, comprises only around 40% of the total population), it seems that the general sentiment is that this country is so badly-governed that entertainment is a happy escape from the current mess we are in. But often we forget that there are also many good things going on in this country’s government. I do not want to be an apologist of the government but I want to speak of two experiences where I can say that as a citizen, I have benefitted from government’s willingness to protect the interest of its citizens and from government’s responsiveness to an ordinary citizen’s questions and concerns. I am a post-paid subscriber of Smart Communications for almost 10 years now and I have not had significant complaints regarding billing until 2013. I went to South Africa on a business trip and when I came back I was surprised to get a billing of around 80K Php when I got back because of data charges. I wrote to Smart that I have not used data while abroad and the giant telco that it is, it never cared to reply. So I wrote to DTI’s Consumer Protection and Advocacy Division with this long letter, which explains in full detail my allegation. I was prompted to seek the assistance of DTI because Smart never cared about my rights as a consumer and threatened to cut off my subscription unless I paid, and that if I continue to question the charges, they will hand my account to the legal department for collection and appropriate legal action. The letter above is self-explanatory. When CPAD received the letter, it forwarded my concern to the National Telecommunications Commission, who has jurisdiction over the complaint. Smart responded with a call from its customer relations and sent letters implying that they are doing an investigation. For more than 10 months, Smart slept on my complaint and at some points insisted on the validity of their chargers and cutting my subscription. For the many times that Smart did, I wrote to CPAD for support. CPAD again wrote to NTC copying Smart and my line came alive again. This occurred for more than twice until I wrote the following letter to NTC. In the subsequent letters related to this one, I wrote to the DTI and NTC that I would like to seek advice as to what legal action I can take. It was during this time that Smart responded positively, and finally erased the charges, saying it was goodwill reduction. To this day, I still maintain that I did not use data services as I use WIFI connection for data tasks in all my trips overseas. Smart does not have the right to charge me, so they do not have anything to reduce. I should credit CPAD for the responsiveness though NTC fell short of my expectations. It is important to be mindful, that it’s not only government that has the capacity to oppress. As my experience suggested, business giants are more positioned to disadvantage consumers. This even excludes how Telco companies sell our data even without our consent. I emailed Mr. Nemenzo several times after this, clarifying for example some items in the email above. Mr. Nemenzo was very responsive, and even corrected some of the information that he already gave. It just seemed surreal to me, that a blog writer like me, who expected that no one reads his entries, got the attention of the highest public official in the city. I should say that this is the first time that this happened to me, after writing many times about issues concerning Bohol. I should commend the city administration of Mayor Yap for being responsive though I also recommend that more proactive discussions should be done with civil society organizations on issues and concerns concerning Tagbilaran city residents be done in the future. According to Besley and Burgess (2000:1), “a more informed and politically active electorate strengthens incentives for governments to be responsive”. My experience provides evidence that such is so. The implication therefore is that when we want to complain to government, we need to bring with us information on why we complain, the basis of what we are complaining about, and the reason why government should respond. Armed with these tools, only a government who does not want to be accountable will turn a deaf ear. 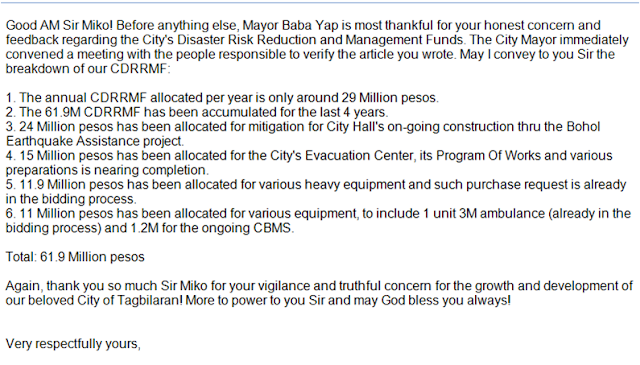 Kudos to Mayor Baba Yap. Lahi ra jod ning batan-on kay maminaw pa.
MIKO - I forwarded your article to CA Edi Borja and PMed him on the matter and he acted with dispatch. And, was thankful to for the citizen feedback.